With Spring and Summer on its way, many families are looking for ways to get outside, enjoy the nice weather, but still be with their families! I have the perfect solution for families who want to stay active this summer: the Schwinn Trailblazer Bicycle Trailer. Taking it on the road has never been easier thanks to a little help from Schwinn, the original family bike company. The company's speedy, lightweight Trailblazer double bicycle trailer is fast on the setup and easy to hitch, making it a breeze to haul your kids on a ride through the country or a trip to the farmer's market. The Trailblazer is equipped with a lightweight aluminum frame that provides plenty of space for each child, along with fast-rolling 20-inch wheels. The trailer's universal coupler is just as well conceived, with a design that attaches quickly and easily to most bikes. And once you arrive at your destination, you can convert the trailer into a stroller in mere seconds. Other details include a zippered weather shield that provides extra protection in poor weather, a quick-release wheel design for easy storage; and a total capacity of 100 pounds and two children. My husband and I have ALWAYS wanted a bike trailer because one of our favorite activities in the summer is bike riding. With two children (soon!) we needed a double bike trailer and we SO EXCITED to have this Schwinn Trailblazer Double Bike Trailer so we can go on bike rides with both kids! The bike trailer has some really great features that make this trailer unique. The first great feature is the back window that can either be zipped up to keep it warmer in the trailer for the children (great for early spring weather or cooler fall weather) or opened up to let the breeze blow through to cool it down in hotter weather. It only attaches by little bands so I hope it will hold during rides, but so far it has! I love the nice big windows on both sides that allows the children to see what is outside. It also has a nice big front window. Once again, I love that it can either be a screen for hotter weather and allow the breeze to blow through or you can pull out the full plastic window out of the nice little storage pouch on top and keep it warmer inside. To get into the trailer, you have to undo the whole velcro along the bottom and a button on at least one side. I personally would have liked to have an easier way to open up the front (like a zipper possibly) but overall it is not too bad. As for seating, there is seatbelts that can be for a single passenger or for double. It is really easy to switch between the two and I really like that. Here is how a single rider sits. Here is how double riders sit. We used my son's best buddy, "Monkey" to show you how two riders sit in the trailer (since our baby girl is not quite here yet or old enough!). The seatbelts are easy to put on and off and they allow you to easily adjust for different sized children. One of the best parts of this trailer is that it can be used as bike trailer OR stroller. Here is the trailer as a stroller with the single front wheel on it. I noticed while using it as a stroller that it is very lightweight and easy to maneuver. Unfortunately, the front wheel wiggles a lot and makes A LOT of noise and it gets to be really annoying. However, the trailer is easy to tip up and just push on the back wheels and it fixes that problem. I just wish the front wheel was a little more stable. We will probably be using this primarily as the bike trailer, so I won't even have to worry about that most of the time. To transition from stroller to bike trailer is super easy and I love that! You just simply take off the front wheel and easily attach the attachment to the back wheel of any bike (there is one simply part to attach with a wrench the very first time). It is super easy to switch between stroller and bike trailer and that makes it great for going to the zoo, going on walks on the beach, and going anywhere where you need to bike there and then walk with the stroller! Here is the bike trailer attached to the bike! It moves really easily in all directions that a bike can go and it feels really stable. I have never worried about the trailer flipping or being unstable. Overall, this bike trailer is going to be perfect for our family. We love to be active and now we can still do it as a family and still go on bike trips to the beach, park, and to our nearby bike paths! I love that it holds two children and it is so easy to switch between double stroller and double bike trailer! It was easy to set up and is very lightweight to push and pull - you don't even notice it is there! My son LOVED riding around in the trailer and honestly asks to take a ride in it everyday! 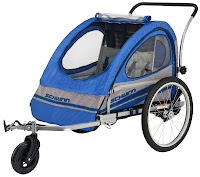 If you are looking for a great way to stay active this summer and give your children a great ride, you really need to check out the Schwinn Trailblazer Bicycle Trailer! I know we are definitely going to enjoy using it!! Buy It: You can purchase the Schwinn Trailblazer Bicycle Trailer for $201.04 on Amazon.com or at Schwinn Signature independent bike shops. Thank you for taking the time to write this review. It was very informative and exactly what we needed in making our decision. Thanks! Thank you..... A very informative and useful review. Sorry if double post....using cell phone... Difficult.